Silver BritePlus is the right choice if you’re cleaning polished and shiny, aluminum or stainless steel. Use Silver BritePlus MX when you are working with very reflective, high-shine and polished metal surfaces. From aluminum wheels and trailer sides to stainless trailer front caps, to pontoon boats, tanker trucks, engine parts and more. If it’s shiny—or should be—use Silver BritePlus MX. Silver BritePlus MX is perfect to use from when your boat or trailer is new—before any damage has been done to the polished finish. After using Silver BritePlus MX, the difference looks amazing! Sometimes—without Silver BritePlus MX — it’s not going to shine again! This before-and-after image above is a great example of what Silver BritePlus MX can do to really put the shine back on a Wilson stock trailer. This is a relatively new polished aluminum stock trailer. It gets used all the time by a busy cattle company here in western Oregon. And—until this point—it only had the occasional pressure washing. In cases like this, detergents and scrubbing won’t do much more than pressure washing. That’s what the left side looks like after a pressure wash and scrubbing. It’s much easier to keep a trailer looking great when you start using Silver BritePlus MX long before the trailer gets to this point! It’s amazing to watch this difficult surface staining and haze literally wipe off. It really washes off like dirt does with soap and water! Even at this late stage stage. And reveals the hidden shine. And if you start using Silver BritePlus MX earlier, you can maintain the original high-polish finish much longer—without any spots remaining. At some point, seriously oxidized patches can only be removed with abrasives or harsh acids. Then the entire trailer would have to be buffed and polished to get an even look. Don’t let that happen. 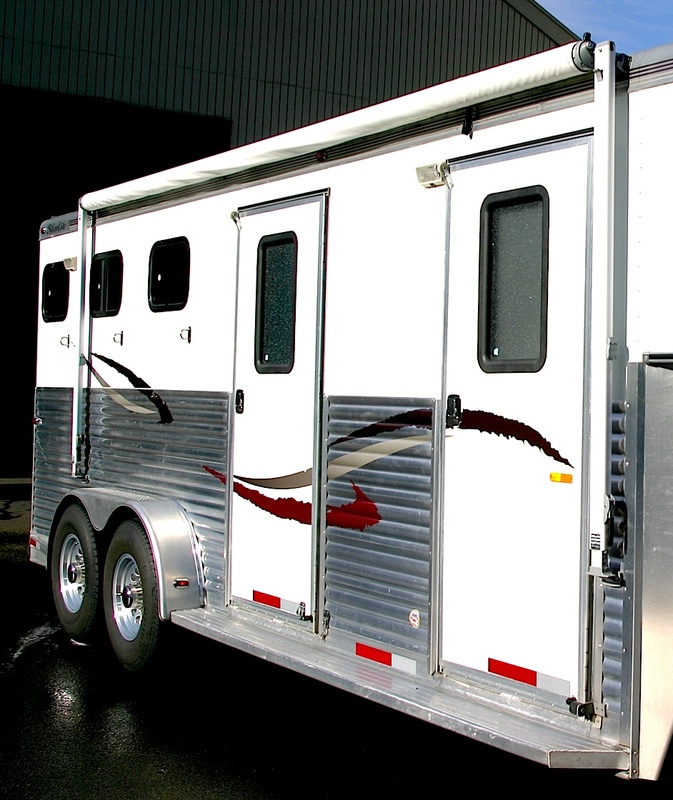 Maintain your aluminum trailer or equipment looking its best, for years. Use Silver BritePlus MX! Silver Brite MX is economical, safe & simple to use. — Ready to go—no mixing required. — Environmentally safe and user friendly. 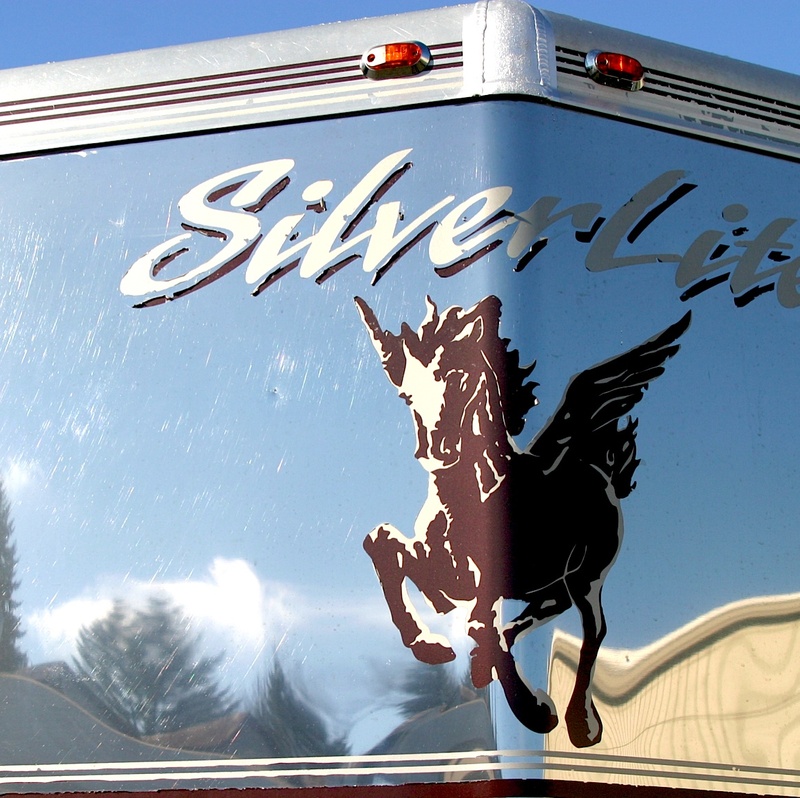 Silver BritePlus MX is a cost effective way to clean painted and polished horse trailers, cattle pots, over-the-road trailers, tankers, engine compartments, wheels and much more. A 2.5 gallon container is enough product to clean a 20 foot trailer twice. Order today for professional results at home! As tough as it is—designed to clean oxidized aluminum—it’s still safe for the user and the environment. With an 15-year commercial track record. Proven by auction companies and trailer manufacturers nationwide. And now available directly to you! BriteWash is a second-stage additive! It makes either Silver BritePlus or BritePlus even more effective. Simply add BriteWash by brush WHILE the Silver BritePlus MX (or BritePlus MX) is on the surface you are cleaning! Agitate this combo with the brush TOGETHER. We continue to get questions about this…but it’s very simple! First apply Silver BritePlus MX (or BritePlus MX) with a garden sprayer and agitate with a brush on the surface. Add BriteWash (mixed with water in a bucket) to the same wetted surface with a brush. Scrub the two together. The chemical reaction of this mixture creates the extra cleaning boost to lift and remove the stubbornest stains, films and haze. This also neutralizes acidity. After you rinse the combination you’ll be amazed! BriteWash on its own is an outstanding general purpose cleaning concentrate. Use it mixed with water between applications of Silver BritePlus MX or BritePlus MX. This ensures that future full-cleanings with the Silver BritePlus and BritePlus will be even easier.